July 19, 2016 - Like us now! Bioniks, a prosthetics provider, in collaboration with Xplorer 3D (a 3D printer manufacturer) and Viscous.co (3D printer retailer) to provide a child with a 3D printed hand. Mir Bayyaan Baloch, a five-year-old boy, is the first Pakistani child to receive such a treatment. 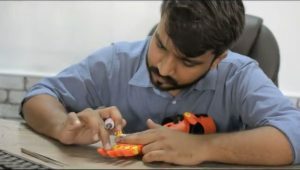 Mir was born without a right hand, but the companies involved along with the cooperation of Mir’s father, Mir Umer Baloch, have given him an artificial hand that allows him to do everything other children can do. Stephen Davies and Drew Murray’s Team UnLimbited were one of the first resources that Mir Umer found when he was looking for a prosthetic hand for his son on the Internet. Stephen and Drew had designed the UnLimbited Arm, a prosthetic for individuals that have no hand but a functional elbow, which was used for Bayyan’s right hand. Once Mir Umer had found the perfect prosthetic for his child, he reached out to Bioniks for the case. With the help of a Xplorer 3D printer stationed at the NED University of Engineering and Technology, Bioniks printed the UnLimbited Arm. They then adjusted the device to fit the boy’s arms. The work on the 3D printed arm was carried out at NED’s MakerStudio (a 3D Printing Facility) that is running under Viscous.co. The printers available at MakerStudio have been donated by NEDEA Chicago, NED ALEF, and Indus Pencil Industries (Pvt.) Ltd. The 3D printed prosthetic arm was then fitted into Bayyaan’s arm to give him a completely function right hand that he felt comfortable with. Previously, Bayyaan was not able to shake hands, give high fives, and even hold objects with his right hand. Mir Bayyaan Baloch may not realize that he is the first-ever child in Pakistan to receive such a treatment but he is very excited about finally being able to live his life as any other child would. This is an incredible feat achieved through the dedication and passion of companies such as Bioniks and Xplorer 3D, and individuals such as Mir Umer, Stephen, and Drew.